Welcome to the Glynn County Health Department where our public health team is dedicated to improving the health of those who live, work, and play in our county by preventing disease and illness, promoting health and well being, and preparing for and responding to disasters. Glynn County Board of Health meetings are held at 8:30 a.m. at the Glynn County Health Dept. located at 2747 Fourth Street in Brunswick. Glynn County Hurricane Registry for those with functional, access, or medical needs Information about the Functional and Access and Medical Needs Registry, which is made up of residents who may require transport and medical assistance during a hurricane evacuation and have no other resources such as family, friends, neighbors, or church members to help them if they need to evacuate. Glynn Co. Board of Health Members and Public Health Managers Learn more about the administrators and the 7 members of the county Board of Health. Glynn Co. Board of Health Rules for Swimming Pools, Spas, and Water Parks Visit this page to download rules regarding public and semi-public swimming pools, public and semi-public spas, and recreational water parks. Glynn Co. Women’s Health Services Women’s Health Services (formerly known as Family Planning) are provided directly by your local health department. Glynn County Environmental Health Information Find food service applications, tourist accommodation applications, on-site sewage information and more. 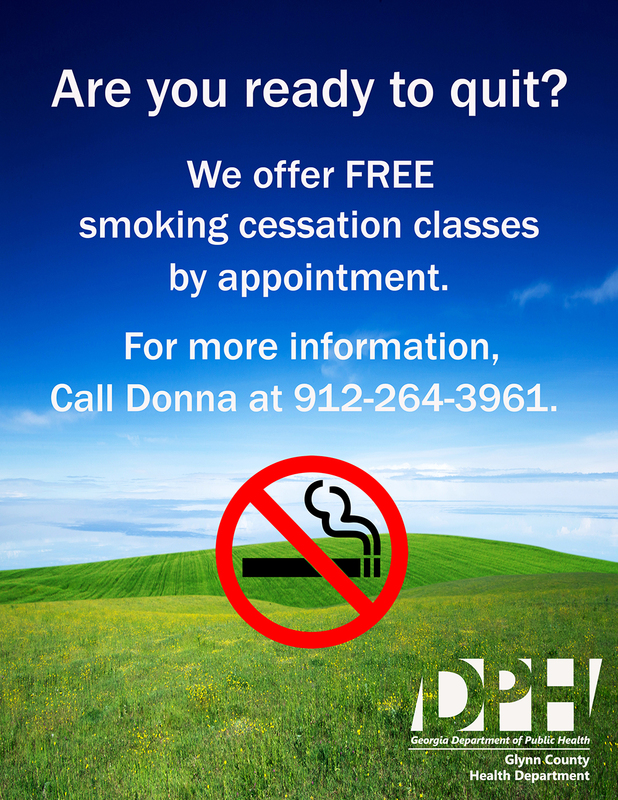 The Glynn County Health Department will hold FREE smoking cessation classes by appointment. For more information, please call Donna Smith at 912-264-3961, ext. 3210 or email Donna.Smith@dph.ga.gov. Flu season is unpredictable which is why it is recommended that everyone six months and older get vaccinated against the flu every year. Last year’s flu season was very severe and lasted well into the spring months. The health department will offer flu vaccine beginning September 24. A drive-through flu vaccination clinic will be held from 8 a.m. to 6 p.m. on Thursday, October 18, at the Glynn County Health Department located at 2747 Fourth Street in Brunswick. 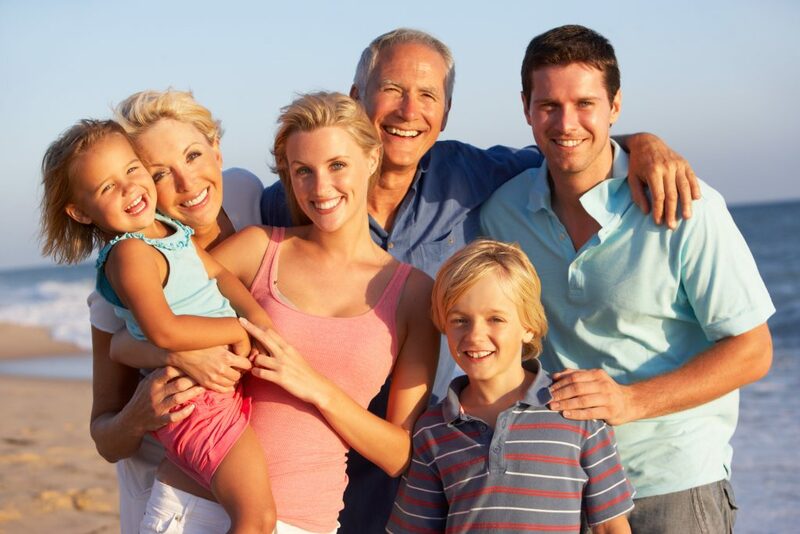 Getting vaccinated is the best protection against flu. For more information on the vaccine or to download the vaccine consent form to save time before heading to the health department for your flu shot, check out the Glynn County Health Department Flu Vaccination page. Three out of four car seats is installed incorrectly. Is yours one of them? Motor vehicle crashes are the leading cause of death among children ages 2-14 and the leading cause of injury-related death for children under two. When installed and used correctly, child car seats and seat belts can prevent injuries and save lives. Call 912-264-3961, Ext. 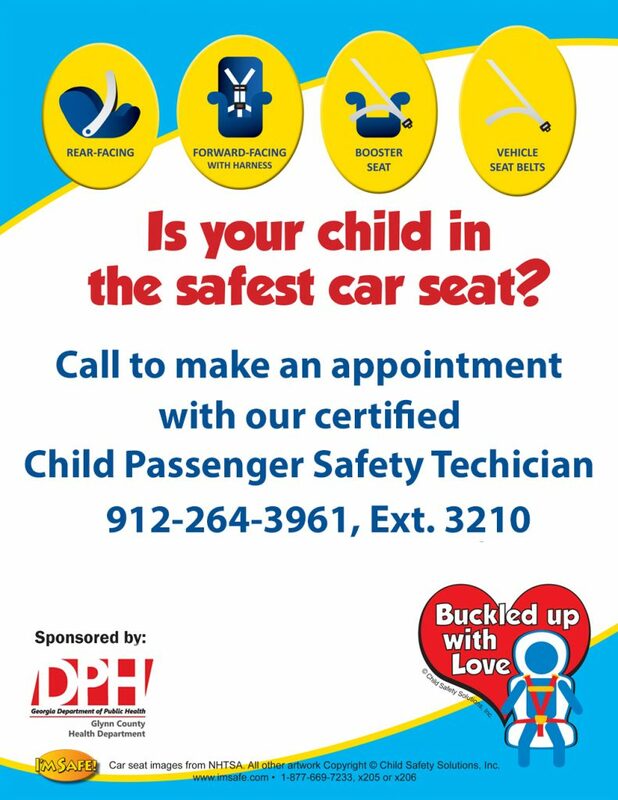 3210, to schedule an appointment for a FREE car seat check with our certified Child Passenger Safety Technician.